"Heartfelt, romantic, and quietly groundbreaking. This book will save lives." -- Becky Albertalli, New York Times bestselling author of Simon vs. the Homo Sapiens Agenda It's just three words: I am nonbinary. But that's all it takes to change everything. 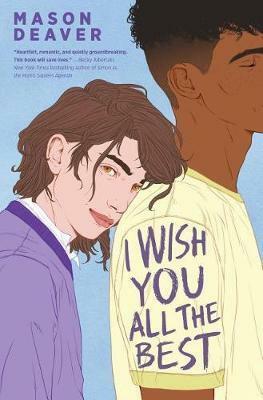 When Ben De Backer comes out to their parents as nonbinary, they're thrown out of their house and forced to move in with their estranged older sister, Hannah, and her husband, Thomas, whom Ben has never even met. Struggling with an anxiety disorder compounded by their parents' rejection, they come out only to Hannah, Thomas, and their therapist and try to keep a low profile in a new school. But Ben's attempts to survive the last half of senior year unnoticed are thwarted when Nathan Allan, a funny and charismatic student, decides to take Ben under his wing. As Ben and Nathan's friendship grows, their feelings for each other begin to change, and what started as a disastrous turn of events looks like it might just be a chance to start a happier new life. At turns heartbreaking and joyous, I Wish You All the Best is both a celebration of life, friendship, and love, and a shining example of hope in the face of adversity.